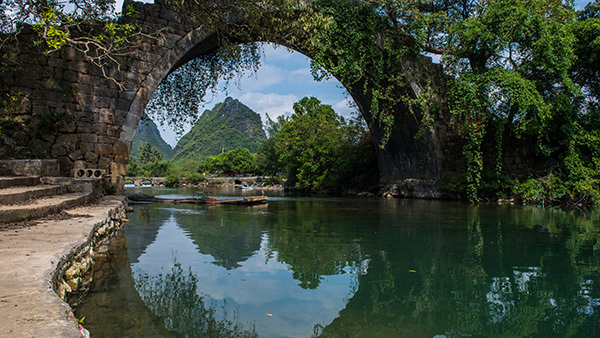 The best season for photography in Guilin is from May to September. During this time there is less rain and better opportunity for landscapes in good light. 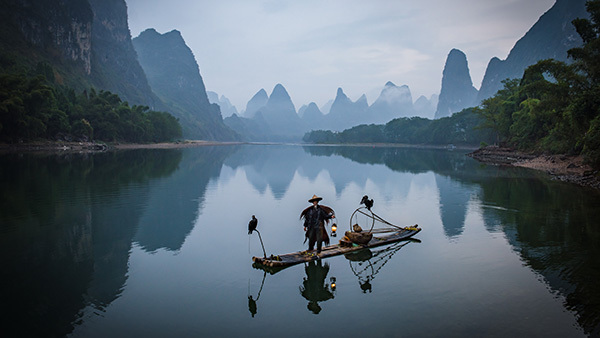 In 2018, we had the best landscape photography, with perfect sunrises and sunsets, in May to August, then early October and early November. When we talk about 'the best time', however, it is not absolutely the best time for all kinds of photography. 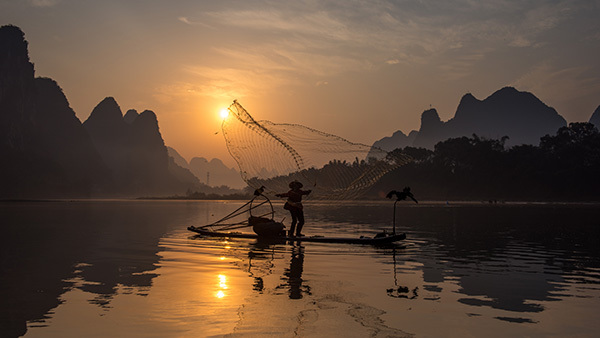 March to May could be best for photographing flooded rice terraces, but it may not be best for mountains and rivers, as there are fewer clear sunrise and sunset opportunities. 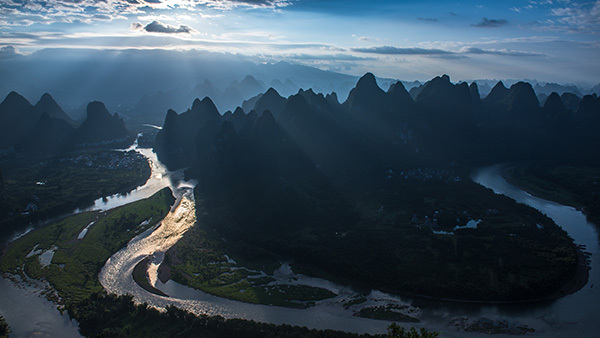 From June to August, there are more opportunities to capture beautiful sunrises and sunsets over mountains and rivers, although there may also be rainstorms or even typhoons, and then the rivers become yellow and dirty because of flooding. Nothing is perfect, is it? You can actually get great shots in any month, if you are lucky enough. Check out the following photos, taken from January to December. 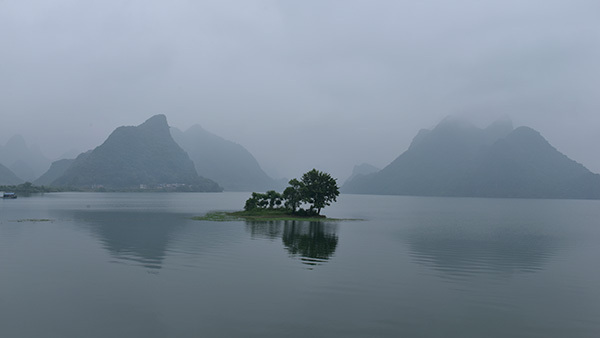 You may already realize there is plenty of rain in Guilin. 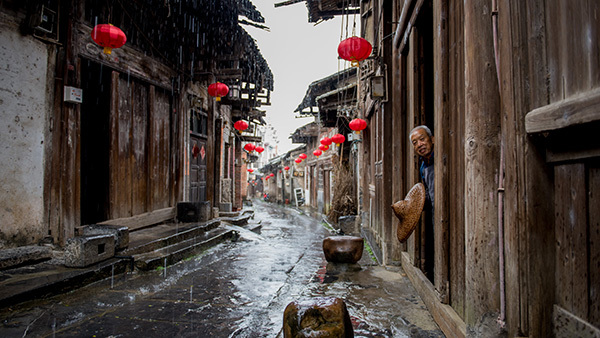 Actually rain from June to October is not a bad thing, for heavy rain clears the sky and mountains, and is definitely good for shooting landscapes. 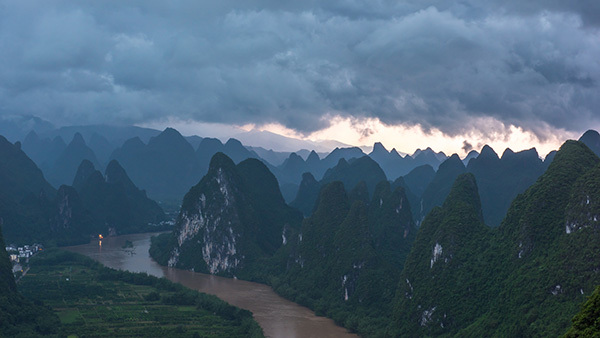 Because of humidity, the mountains and sky around Guilin generally look hazy. You will see the mountains and sky clearly after heavy rain, especially after a typhoon. If your travel dates are flexible, you can check out the monthly weather forecast, and plan for a photography tour after a typhoon. 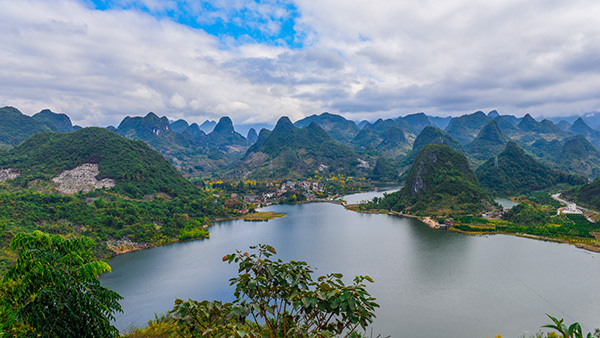 The typhoon season normally affects Guilin from June to October. 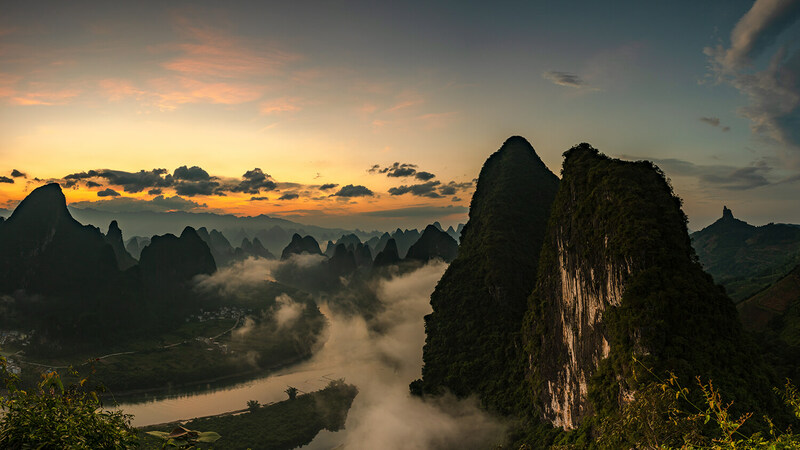 Mountains may be clear for up to a week after a typhoon, with more possibilities at sunrise to capture the seas of cloud between mountain peaks. 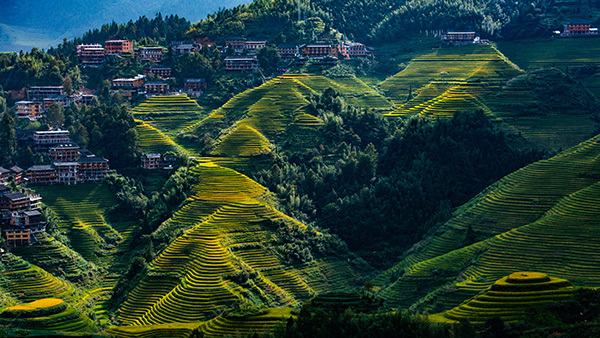 Photography of the Guilin Longji rice terraces is normally focused on two seasons: when all the fields are flooded, and around harvest when the fields are yellow. 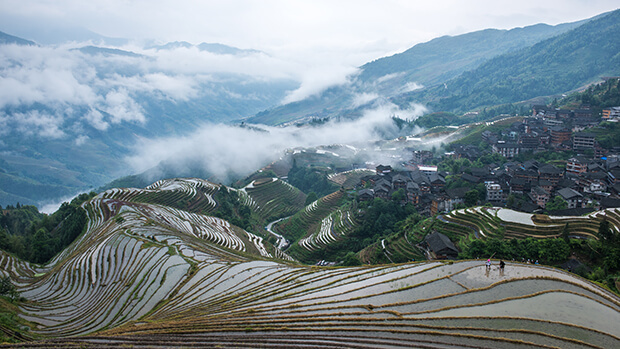 If you'd like to capture the flooded rice terraces and mist in the village, the best time to visit would be between March and the middle of June (rice seedlings are transplanted around June 20th). 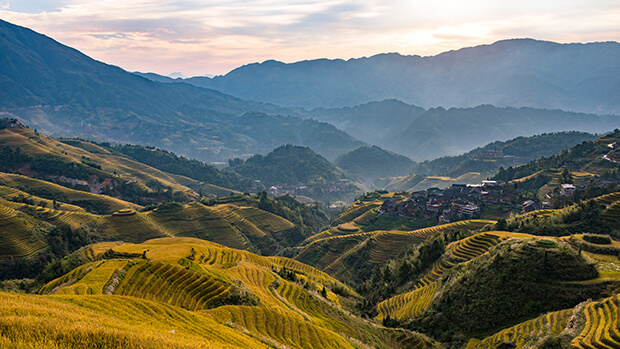 If you prefer to shoot the golden rice terraces, the best time to visit would be the end of September to the middle of October (rice is harvested around October 20th). Please note that the planting and harvest dates may change according to the climate. Note also that it’s better to avoid the first week of October, if possible, for that is a national holiday in China and very crowded. 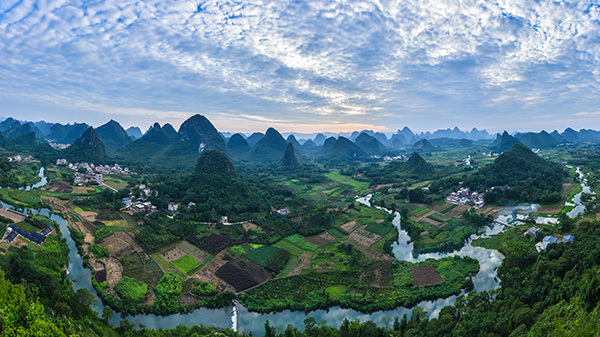 There are very distinct low and high seasons in Guilin. From May to October is the high season, when photography/tourist spots get busy and hotel rates rise. Some holiday-times are extremely crowded, with between 3 to 10 times more tourists than usual. Don't let the crowds ruin your special trip. 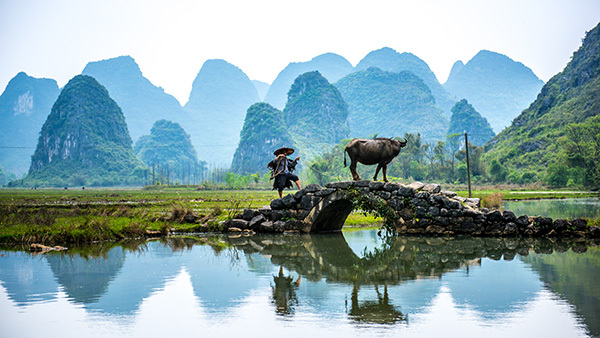 Try to avoid the following dates when planning your 2019 Guilin photo tour. 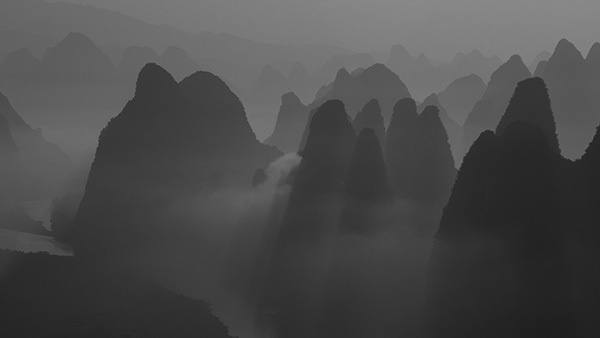 Although most photography locations are only for photographers, the number of Chinese photographers is increasing fast, year by year.